As I step outside, I notice the sky is dark and clouds blanket the sky. Breathing in I can smell the scent of rain is on the way. Walking along the path, I feel a light drizzle begin to fall. The raindrops lightly fall against my skin and I pause to feel this vibrant connection to life. I close my eyes and feel the coolness of raindrops trickling down my face. As I open my eyes, I can see small puddles forming on the ground. Each drop falls shaping and forming a small pool of water and in this moment I am aware of my connection to life. 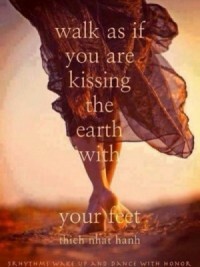 I am connected to the life around me, each footfall lands gently touching the earth. I am connected to the rain as it falls against me. It’s a moment of mindfulness; this contact of senses with the world surrounding me. I wake up out of thinking mind and open to the experience of being right here, right now. As Tara Brach says “We are all drops in the ocean.” We’re on this planet together. We may look different, speak different languages but our senses speak the same language and we are made of the same matter. I love this poem by Danna Faulds. It reminds us of this precious connection with each other and life. that is or ever will be.